Australian Energy Research Laboratories (AERL) was founded by Stuart Watkinson (BE Elec. Eng., Grad. M.I.E.A) in 1985 to commercialize his “Power Optimizer”, a revolutionary solution to a complex problem, developed while studying at the University of Queensland in Brisbane, Australia. Unlike many inventors, Stuart possessed not only a great idea, but also the entrepreneurial skill to turn it in to a commercially viable product. 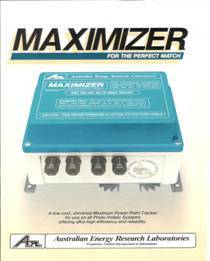 The “Power Optimizer” would eventually come to be known as the AERL MAXIMIZER™, the world’s first truly Universal Maximum Power Point Tracker (MPPT). After the completion his thesis, titled “The Generation of Electricity from Solar Energy”, Stuart was approached by the Director of the University of Queensland’s Solar Energy Research Centre to devise an electronic unit that would extract maximum electrical power from a 400W photo-voltaic array and deliver it to a DC electric motor to assist in propelling a 4-rider solar tandem pushbike. The pushbike, “Solar Tandem”, was a unique vehicle designed to combine human effort – in the form of pedal power – with electrical energy from solar cells to create an energy-efficient method to transport 4 riders at unusually high speeds. The experiment intended to prove that a hybrid system of human and photovoltaic [PV] energy can eliminate the need for conventional batteries, while minimizing the size of the PV array required for a given application. 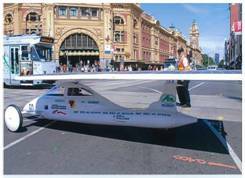 In September, 1984, “Solar Tandem” was entered in the Courier Mail’s “Great Paper Chase” from Cairns to Brisbane – a special 1000km “Mall to Mall” race held annually in Queensland, Australia. The “Solar Tandem” took Equal First Prize for “Engineering and Innovation” and shortly after, Stuart filed the provisional patent for his invention which he named the “Power Optimizer”. The fledgling “Power Optimizer” device, produced in a small home laboratory during a two-week vacation from University, was unique. It leveraged a remarkable and little known electrical relationship that exists between solar photovoltaic cells and provided a comparatively simple, innovative solution to an otherwise very complex problem. After graduating from University with a Bachelor of Science in Electrical Engineering, Stuart joined the South East Queensland Electricity Board in February 1985, working in the field of power system engineering and power electronic design. In June of 1985, taking leave without pay, Stuart explored the Canadian, North American and Japanese markets with an early prototype of his “Power Optimizer” device, presenting it at the biennial Solar World Conference in Montreal, Canada, where he received encouraging approval from delegates. Upon returning to Australia, Stuart’s spare time design efforts were enthusiastically concentrated on tailoring a commercial product to meet the diverse requirements of overseas markets. By September 1985, Stuart’s development efforts had resulted in an important breakthrough, overcoming the limitations of the original “Power Optimizer” design. This new version combined some of the features of his original design with the more recent innovation to become what would known as the first MPPT Solar Charge Controller. The US Department of Energy’s Solar Energy Research Centre in Colorado, along with Florida State University’s Solar Research Centre at Cape Canaveral were involved in early trials of the product. General Fertilizers Pty Ltd (a division of ICI Chemicals) conducted several field trials using the MAXIMIZER™ on Remote Area PV Solar Water Pumping Systems resulting in an 100% increase in the volume of water pumped. These trials demonstrated the enormous benefit this innovative, first-of-its-kind device could have on the farming and agricultural industry. ARCO Solar (wholly owned by the Atlantic-Richfield Oil Company) – the largest manufacturer of Photo-Voltaic Modules in the world at the time – endorsed the MAXIMIZER™ thanks to its revolutionary performance and benefit to the global PV industry. Pacific Gas and Electric (PG&E) California, the fifth largest power utility and responsible for the largest Photo-Voltaic test program in the world (sponsored by the US Department of Energy). PG&E’s testing had stalled because of the absence of any device that solved the problem of Maximum PV Power Extraction – until the advent of AERL’s MAXIMIZER™. 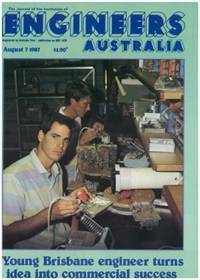 Stuart’s developmental efforts went from strength to strength, and in 1986, AERL was recognized for its achievements with the “1986 Award for Excellence in Innovation” from the Queensland Innovation Centre. 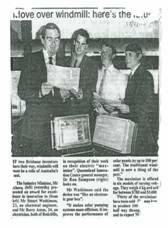 That same year, AERL also received the Queensland ”Austrade Qantas Export Award for Initiative and Enterprise” from The Australian Trade Commission (Austrade). Shortly after the release of the MAXIMIZER™, AERL began development of a low-cost, compact and highly specialized power electronic Cathodic Protection controller for use in off-grid Cathodic Protection systems protecting oil, gas and water pipelines. In early 1989, AERL’s first range of high-efficiency, low loss CATHODIC CONVERTERS™ was launched. 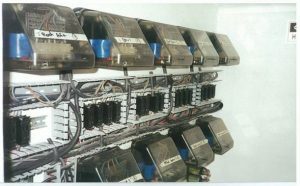 As with the MAXIMIZER™, AERL’s specially designed Cathodic Protection controllers quickly developed a worldwide reputation for efficiency and reliability. In the late 1980’s, AERL further expanded its footprint in the solar energy market by developing a specialised lightweight version of the MAXIMIZER™ for use in Solar Racing Cars, named the “Race Trim Mini MAXIMIZER™”. AERL quickly developed a reputation within the International Solar Car “fraternity” for supplying highly efficient, reliable and robust Solar Racing Car MPPT Solar Charge Controllers. In fact, by 1990, eight of the top 11 finishers in the world’s most prestigious Solar Racing Car event, the World Solar Challenge, raced with AERL MAXIMIZER™ . AERL itself had an entry in the World Solar Car Challenge that year, winning the Lead-Acid Battery Category and taking 6th place in a field of 36 entrants. Thanks to AERL’s success in the 1990 Solar Race Car Challenge, over 75% of the teams competing in the World Solar Challenge and US Solar Car Races held between 1993 and 2007 used the AERL MAXIMIZER™ MPPT Solar Charge Controller. More than 1000 specialised Solar Race Car MAXIMIZER™s MPPT Solar Charge Controllers have been shipped to more than 200 teams worldwide, including more than 60 of the world’s leading universities. In 1992, AERL moved to new facilities and expanded its operations to meet the exploding demand for its products. Over the ensuing years, AERL continued to manufacture and ship its revolutionary products around the world while further improving and developing its range. In the early 2000’s, AERL continued the expansion of its product range, launching MPPT Solar Charge Controllers suitable for use in both Micro Hydro and Micro Wind Turbine applications. By 2006, extraordinary developments in component technology made it possible for AERL to develop an extremely compact and lightweight, but most importantly, more efficient, version of the MAXIMIZER™ MPPT Solar Charge Controller. This new version of the AERL MAXIMIZER™ was promptly named the COOLMAX™. By early 2008, AERL was preparing to launch a major marketing campaign to promote it’s new and improved revolutionary products. Sadly, AERL’s founder, Stuart Watkinson, lost his 15-year battle with the rare auto-immune disease Churg-Strauss Syndrome, passing away on June 23rd, 2008. Stuart was well respected and widely regarded as a pioneer within the renewable energy industry for his work on the development of Maximum Power Point Tracking. A form of Stuart’s MPPT technology is still used in AERL charge controllers to this day. Click here to learn about AERL’s current generation CoolMax SRX charge controllers. To learn more about Churg-Strauss Syndrome and help in the battle to defeat this deadly disease, please click here. Sign up to our newsletter and stay up to date on AERL News, Product Releases and Industry Information. AERL manufactures highly reliable and efficient specialised power electronic controllers for use in Solar, Micro Hydro, Micro Wind and Cathodic Protection applications.